White Potatoe Soup Coambank Cut a Breast of Mutton 6 pound in small pieces, and put them into three quarts of Water, make it boil and skim it well. then put Pepper and Salt to your taste - pare in six potatoes, four Onions, two heads of Celery - three leaks, three Turneps - a small bunch of sweet herbs, and let it boil gently for five hours - strain all you can into a Stew Pan, and rub the Stock through a Sieve, make it quite hot, putting in a pint of Cream, with the yolk of an Egg beat up in it - and serve it up to Table with bread. 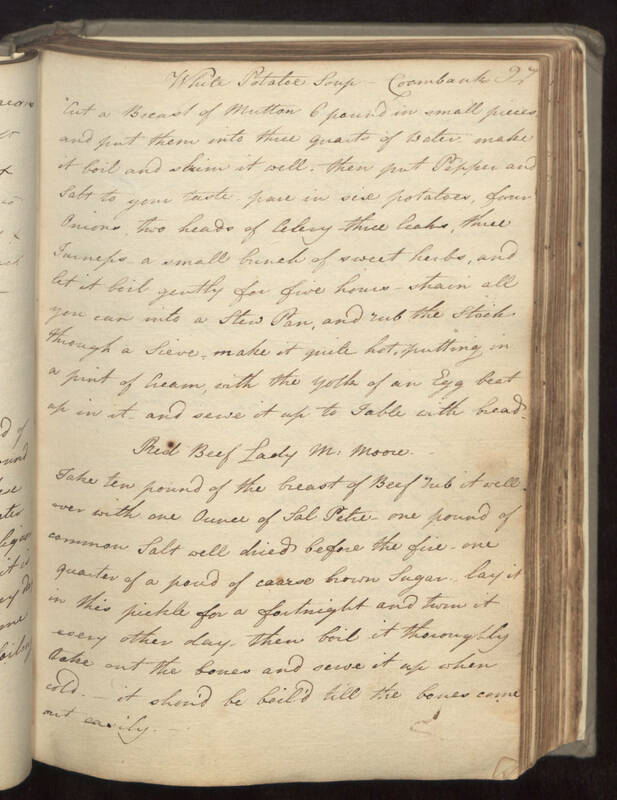 Red Beef Lady M: Moore - Take ten pound of the breast of Beef rub it well over with one Ounce of Sal Petre one pound of common Salt well dried before the fire - one quarter of a pond of coarse brown Sugar. lay it in this pickle for a fortnight and turn it every other day - then boil it thoroughly take out the bones and serve it up when cold. - it should be boiled till the bones come out easily.